Have you experience different mood swings at the same time. Maybe this is because of Bipolar Disorder. 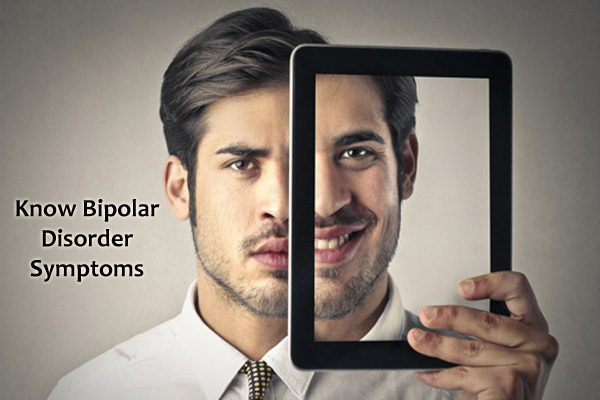 Know the list of Bipolar Disorder Symptoms to spot the disease at early stage. Bipolar is a type of mental illness in which about 5 million people are affecting with this disease. Also, about 60 percent people having this manic depression disease are committing suicide. Usually, it is diagnosed during adolescence or early adulthood. Hence, early recognition of signs of mania is more important to ease Bipolar Mental Disorder symptoms. Bipolar disorder is a mental illness that makes people swing between different moods, activity levels, and energy levels. Formerly, Bipolar disorder is also known as Manic Depression which causes up’s, and down’s in mood swings or from high to low or vice verse. The most common episodes of Bipolar Disorder are Mania which lasts for a few days and depression that will over in a few weeks or months. The patient who is suffering from the manic stage will behave as hyperactive for sometimes and euphoric. While depressive stage patients may feel too tired, guilt, decrease in self-esteem. The causes of this bipolar disorder change between individuals. Often genetics also contribute this manic depression disorder. It will be dangerous when this disorder goes to suicide stage. Hence, proper diagnosis and treatment are necessary at the initial stage. So, you must identify the bipolar disorder symptoms at first. Check the list of symptoms of bipolar disorder for various episodes. Mania or Manic Episode is a Bipolar disorder describes an extreme feeling of high energy. This elevated mood is also known as hypomania. People with Mania disorder behaves happy, feel irritable or seems like energetic. The Manic symptoms will last for either few hours or few days, weeks. Mostly these type of bipolar mood disorder symptoms is seen in adults. The common symptoms of Mania include the following. People who affected with a manic bipolar disorder can easily distract and behave with uninterruptible manner. Having the racing thoughts, they will not stay on one subject and jumps from one topic to another very quickly. Hence, they will not concentrate on one thing. Speaks continuously that no one can understand what he/she is saying and feels like to jump. Also, persons with the bipolar manic disorder may find difficulty in sleeping. Stays whole night with no sleep or sleep for only a few hours. Even they don’t have a night of sleep, doesn’t feel tired or restless. During Manic Episode, a person may invest money in risky business. Also, spends excessive money for expensive things. Sometimes they will quit the job for no reason. At critical situations, a person may experience Psychosis which means a break with reality and come in contact with delusional ideas. About 50% of people with Mania Bipolar Disease can have delusions or hallucinations. For example, believes that some persons are doing harm to them. It looks that they have full of new ideas and makes unattainable plans. An increase in goal-oriented tasks. Unfortunately, people who have a bipolar disease may encounter depression episodes. The depression and mania are opposite in the time of appearance. Maina occurs rarely and will last for a few weeks while depression bipolar will occur frequently and exist for a longer time. Signs like Anger, Irritability, feelings of sadness. Persons with depression episode may lose hope. Lack of interest on the parties or any other that they already enjoyed previously. Bipolar Disorder patients with depression episode may sleep more than the enough. Can’t able to concentrate on problems. Thoughts for attempting suicide or death. Find changes in weight and appetite. Feelings of worthlessness, guilt, helpless. Like Mania, Depression episode also lead to psychotic features like delusions, and hallucinations. You may find these depressive disorder symptoms for at least two weeks. Also, these signs of bipolar depression disorder will continue to next six months if they left untreated. The mild form of Mania is Hypomanic Episode which lasts for four days. It is an abnormally elevated mood that is less severe than Manic Bipolar Disease. Having hypomania, the person doesn’t find difficulty in their social life. Often, patients with hypomania do not require hospitalization. Even they feel elated, increased appetite; they can go to the office or do their daily work. Also, hypomania patients cannot have delusions, hallucinations problems. Some people behaves with good creativity while others have impaired or poor judgment. The mixed state of bipolar mood disorder is a condition in which both depression and mania symptoms occur at the same time. With mixed state, a person will experience Mania symptoms like grandiose thoughts and Depressive signs like excessive guilt, suicidal thoughts. With both of these two episodes, a person will have the idea of committing suicide. The most common symptoms of mixed bipolar mood disorder are insomnia, lack of concentration, hyperactivity, racing thoughts. Also, hopelessness, mood swings, feeling guilt, difficulties with impulse control. People with bipolar disorder symptoms may also encounter bipolar anxiety at some conditions. Also, patients will addict to substances like alcohol, drugs. Both men and women have the same type of bipolar personality disorder symptoms but with a few changes. The main difference is men are prone to develop signs of bipolar disorder at an early stage. Most common type of disease seen at an early stage is generally Mania. Besides this stage, a person will do things like fighting, drinking, etc which can lead to severe risks or problems. Also, they are more abuse to drugs, alcohol which can cause illness. With all these signs of bipolar disorder disease, men need hospitalization. Often, sometimes lead to suicide which is less likely for women. The other bipolar disorder symptoms in adults are same like above Mania and Depressive bipolar mood disorder. In fact, you can see this bipolar disorder in child and teens. The signs of bipolar disorder in children and teenagers are also same as the symptoms for adults. But the treatment options may vary for adults, children, and adolescence. Hence, contact the doctor for appropriate medications and treatment whenever you identify the signs of bipolar. Bipolar disorder has three types Bipolar I and Bipolar II. Depending upon the mood swings between Mania and Depression there is also another type called Cyclothymia or rapid cycling. Of all types of bipolar disorders, rapid cycling is about 10% to 20%. 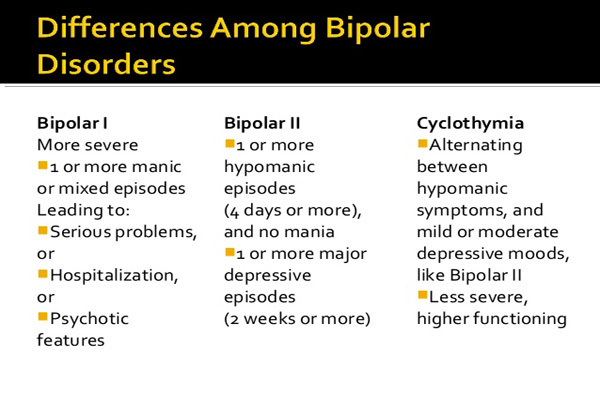 Here are the different signs of various bipolar types. The person with a manic-depressive kind of illness is also known as Bipolar I disorder. Also, an individual with this type of bipolar disease may encounter at least one manic episode or mixed episodes. In addition to this, they will also be prone to develop depression stage. Bipolar 1 disease affected patients will have disruptions in their work and relationships. Also, people who are suffering from this disease can become substance abuse. People who have bipolar 1 disorder can have the chance of getting hyperthyroidism. The suicide rate of persons with bipolar 1 disorder disease is 10-15%. Like bipolar I, the symptoms of bipolar II are a risk to commit suicide, hyperthyroidism. Also, the person may become substance abuse. The substance may be drugs, alcohol. In fact, people with bipolar 2 disorder are misguided as they have depression episode but they can’t. To find this, one should look the characteristics of depression episode. The common symptoms of bipolar 2 disorder are anxiety, racing thoughts, irritability. But less developed symptom is burst of creativity. A Mild form of bipolar disorder which involves mood swing is nothing but cyclothymia. This mood swings will operate like a cycle between Mania and Depression. According to many experts, this stage of bipolar will develop in the child stage, and the onset of symptoms usually appears at adolescence stage. Both men and women can have the same chance for getting cyclothymia. Compared to Bipolar I and II types, it has more risk for substance abuse. In addition to the signs and symptoms, know the causes and treatment for Bipolar mental disorder.